Design-bid-build is one of the most traditional types of delivery methods practiced today. The basic concept behind design-bid-build is a linear process. The owner contracts with the architect to develop a program and then further develops the design using mechanical, electrical, and plumbing engineers. After the design has been solidified, the project moves into construction documentation, with the understanding that the design team will produce completed construction documents for the project to be issued to a number of general contractors to bid on. The role of the general contractor on this type of delivery is to take the documents and specifications and work with subcontractors to define their relevant scope of work and deliver a bid for the project. Using these subcontractors’ estimates, the general contractor then compiles a completed bid. This bid is then delivered to the owner and at this point all other bids on the project are opened either privately or publicly depending on the project type. The owner then awards the general contractor the project’s contract based upon price to complete the project. If a contractor has been consulted to complete an estimate on the project during construction documentation, the project may go over its scheduled delivery date because of additional drawing time due to value engineering. It assumes that cheaper is better. Although that assumption might be correct in regard to cost, it is not necessarily accurate in regard to project quality or the ability of the contractor to adequately perform the work or collaborate with the team. In a design-bid-build delivery it is the assumption that by promoting competition among general contractors the best possible price will be issued. The owner is at risk to the contractor for design errors. General contractors’ bids on this type of project may vary wildly because of both internal and perceived external issues on the project. First, if a general contractor is backlogged and has too much work on their plate, they might bid the project higher. This contractor wants to complete the work they already have and justify the additional cost through staff adjustment, overtime, and other overhead costs to complete the work. Second, the general contractor will gauge the aptitude of the design team based on the documents. Because this is often the only means of collaboration with the design team that the contractor will have during a bid process, aside from a pre-bid meeting, they will raise or lower their costs depending on the detail and accuracy of the documents. Lastly, the contractor is at risk of not being selected. Typically general contractors spend a considerable amount of time and money on producing a bid, and there is a high risk for not being rewarded for that investment. Additionally, even if they are the low bidder on the project, the owner reserves the right to not accept any of the bids regardless of the cost. This drives some contractors to work with owners under other delivery methods that validate their investment of resources to receive a project. 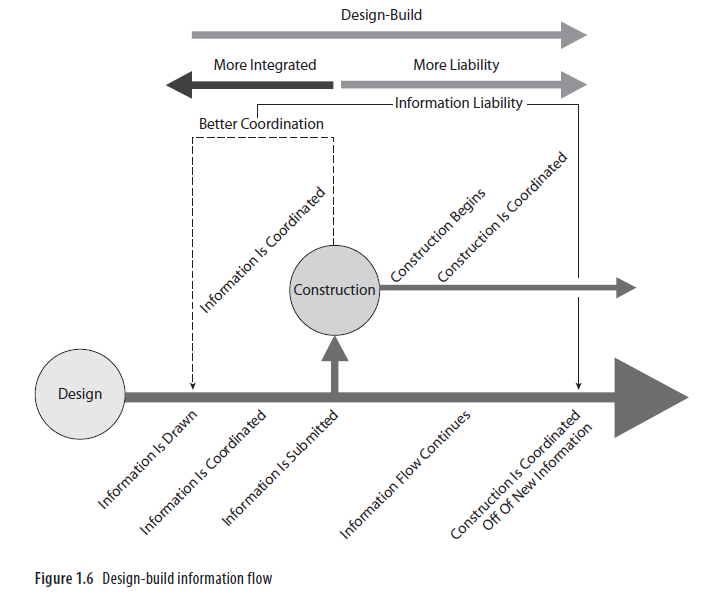 In a design-bid-build contract (Figure 1.4), typically no information is shared in schematicdesign (SD) or design development (DD) between the architect and contractor. Although a contractor might be involved with a design-bid-build project as an owner’s representative or in a design-assist capacity, often that contractor is involved purely for estimate checking and cannot bid on the project, because they might have additional information that would be an advantage over the other bidders and because their contract is for a predetermined fee separate from the construction contract. Since little to no contractor involvement during preconstruction severely limits the design team’s ability to make informed design decisions, the design team is forced to issue “value engineering” options or “deduct” options to reduce the bid amounts for the project. Depending on the type and schedule of the project, information is often not shared with the construction team until the 100 percent construction documentation (CD) phase. Drawings are distributed from the architect or local print shop, at which point the contractor then takes either the sheet drawings or the digital PDF and CAD files and performs a takeoff. The takeoff process, in the case of the sheet drawings, is done using document tracing software, manual takeoff, or on a electronic takeoff software. This process is disconnected in that it relies entirely on the ability of the estimator to correctly interpret drawings that are assumed to be accurate. The problem with the method of takeoff is that the level of interpretation left to the person doing it is great; often, a significant amount of misinterpreted data is input into the estimate. The other resource that is being consumed in great quantity here is time. Especially on larger, more sophisticated projects where it is critical that data is correct, this method takes a large amount of time and effort. This method of delivery often requires numerous clarifications, which are ultimately the sole means of communicating with the design team aside from site or pre tender meetings. Although this method tracks the questions being asked and the answers being issued, it is usually too cumbersome to navigate in a relatively short period of time to provide an effective means of project communication. Often, the big issues are addressed, and smaller issues that aren’t understood are interpreted and assigned a contingency to be resolved later. The typical documentation for design-bid-build is printed sheet drawings and specifications. The practice of providing the contractor with a PDF, CAD, or image file has become more commonplace, and estimating programs such as DimensionX, Candy QTO and Bluebeam can speed up this tracing process. Contractually, however, the design team is not typically responsible for sharing digital files and often doesn’t—to limit any involuntary editing or further possibility for misinterpretation of information. Although the estimating software saves time, this system relies on the estimator to quantify accurately all the building components in a set of drawings and assign prices and estimates to the labour, equipment, and materials associated with that construction, using the architects’ and engineers’ design drawings for accuracy. Although this is the typical responsibility of the estimator, the issue of time continues to come into play. The reasons for this are that in a design-bid-build delivery, the architects and engineers have been working and coordinating drawings for much longer than the contractor, who typically has only weeks to fully understand the site, systems, construction, and reasoning behind the design before assigning a cost to the project. Although much of the project’s estimate basis might be determined by a square-meter cost and subcontractor input, there is a large margin for error because of the lack of time to fully understand the project and all of its nuances. Clarifications are formally issued and addressed in addendums that include supplemental drawings from the architect or engineer, specification clarifications, and other directives. These clarifications are then distributed to all contractors bidding on the project via email, fax, project website, distribution list or public notice. Additionally, these clarifications must be tracked and audited as to when they were issued and that all bidding parties received the clarifications. Again, in this type of delivery, the contractor and subcontractor have no input in the actual design and documentation process,with the exception of clarification and supplemental drawing information and are ultimately responsible for checking with the design team, owner or owner’s representative to verify receiving any further updates. Once the contractor has created an estimate for the project, the contractor’s bid is based on the information provided by the design team and often carries a contingency to allow for information missing from the documents that is later resolved in the field. In this type of project, CAD drawing information is to be built as drawn by the architect and engineer. Because of a lack of flexibility, this process leaves little room for adjustment during construction, which may lead to an adversarial relationship between the designers and the contractors performing the work. The reason for change orders often involves the contractor’s requirement to construct something that may be considered unbuildable as drawn. Another reason is that the contractor might have means of building something more efficiently than what was drawn by using new technologies, past experiences or new tools that the design team wasn’t aware of when they were creating the documents. While this change may equal a price deduct, a change order will need to be issued to address this change. This lack of flexibility may equal additional costs when local jurisdictions having authority, standards and governing building codes require a certain type of construction that the contractor may have been aware of and that the design team might not have been. As the drawings and specifications in the design-bid-build method are the sole means of communicating exactly what is to be built, when situations arise that weren’t thought about in the design and documentation phase, the contractor issues a change order. This is because every item that wasn’t assigned a cost in the initial construction documents is considered “in addition” to original project scope and leads to extra costs. That said, incorrect documentation and lack of collaboration equal more costs, change orders, and inefficiencies in this delivery method. RFIs, and change orders are compiled into a binder and submitted with a operations and maintenance (O&M) manual. These documents are submitted to the building owner after the final walkthrough and the completion of construction work under contract. This usually marks the end of the responsibilities for the contractor. 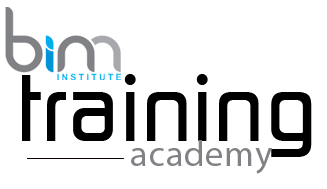 Often the O&M information turned over to the facility manager is an inadequately organized mixture of disconnected information. The facility manager is then tasked with inputting additional information or layers of relevant information over this compilation of disconnected data. This information includes tasks such as work orders and maintenance requests, move orders, associate locations, telephone extensions, equipment warranty information, emergency exit strategies, and any site-specific facility information such as laboratory clean rooms, hospital head walls, sensitive government data, and so on. The CAD files delivered to an owner are usually unreferenced or part of the architecture firm’s legacy information, which might involve customized plug-ins, applications, and routines that are unable to be opened by the new facility manager.